I can tell you, with such relief and excitement, that I am cooking again. A week ago I had my new oven installed, and even though I don't have bench top or sink, it's not stopping me from cooking. I've even managed to get my pantry items sorted, in my pantry, that doesn't have doors. Everything is going to be rearranged again, as it's proving difficult to organise all my stuff into this new space. To be honest, it's more the fact that I have too much stuff than anything else. Which leads me to my New Years resolution. Yes, this year, like every other year, I set myself these admirable goals to which I rarely carry out. I can't even think of last years it's that lame. But that's not going to stop me from creating new ones (or they could be the same ones, I'll never know). First off - get organised. Clean, throw out the stuff I don't need, get a calendar, you know the rest. I have big plans ahead (not really, just big ideas), and sorting out my crap is step number one. Number two - get creative in the kitchen. I've been getting into modern Moroccan style food, Mexican, and really fresh dishes lately, so I really want to try change my diet to include more spices and fresh ingredients. And last but not least, start designing more. I took a break from it 6 months ago due to my job changing, but this year I want to get my head stuck into. So there you have it... At least it's in writing this year so next year I'll be able to cut and paste. So onto this salad. My go to blog for healthy inspirational food, Sprouted Kitchen, posted a delicious looking wild rice salad recipe a year ago. And seeing how hot it is in Australia at the moment, meal times are calling for light dishes. 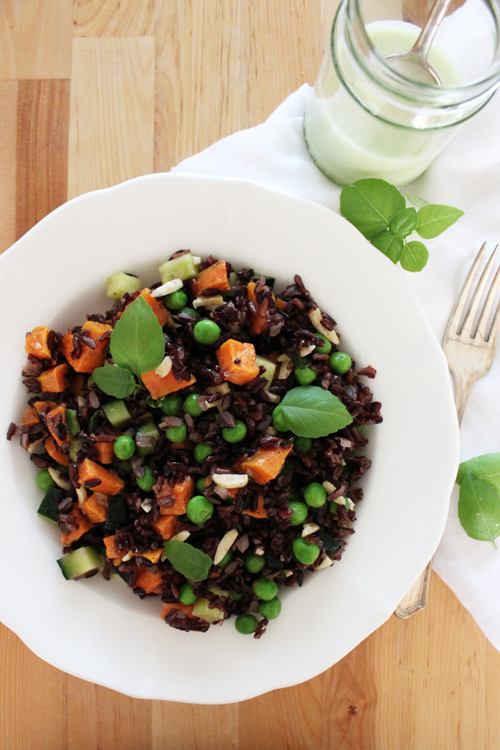 I took the idea of a wild rice salad and ran with it, and came up with the below. You can switch it up, and add ingredients you like or what's in season. I used this salad dressing. Preheat the oven to 180C. Line a try with baking paper and scatter over the sweet potato. Drizzle with a little olive oil and sea salt, then place in the oven and cook for 30 minutes or until soft. Wash the rice in cold water, then place in a saucepan and cover with two cups of water. Bring the boil, then simmer for 20 minutes or until cooked. Drain and set aside to cool slightly. 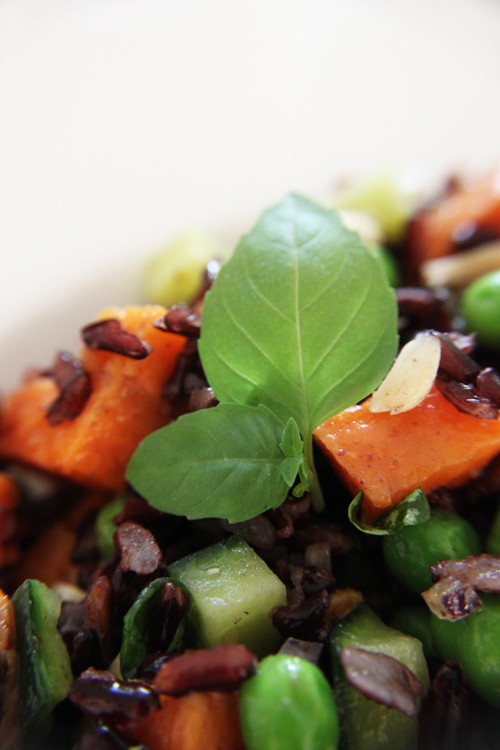 In a large bowl, add the rice, sweet potato, peas, cucumber, almonds, red onion and basil. Give it a good stir. Drizzle over a little oil and salt, and stir through. Dress the salad with the yogurt and basil dressing before serving. Hooray for hearty grain salads! I love the sweet earthiness of sweet potatoes here. 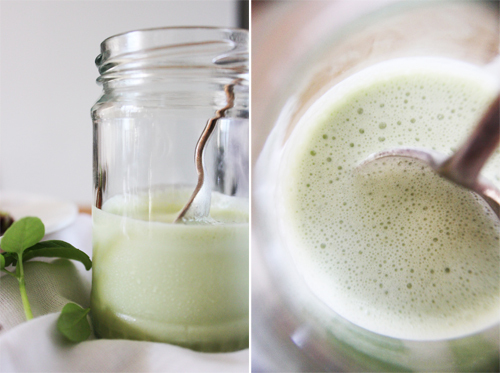 You have a photo of a juice. Could you provide the recipe for it, please? I've already tried the salad and it's awesome! 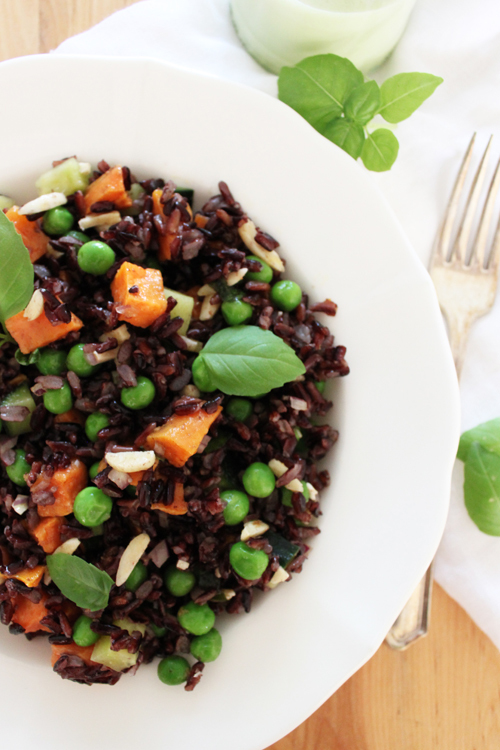 Where can I find the black rice? Hi there, most supermarkets (in Australia) sell black rice, otherwise you should find it in health food shops! This looks very interesting, I have never seen or heard about black rice before. Will definitely try it out! Loved this recipe and the dressing - thanks !